The Peranakans, the descendants of Chinese and Indian traders who settled in Malaysia in the 15th and 16th centuries, are a community emblematic of Southeast Asia’s rich diversity. In Malay, Peranakan means “child of” or “born of”, and the Peranakan are truly children of many ethnic and cultural backgrounds, claiming Chinese, Malay, Indian, Indonesian, Thai and European ancestry. Peranakan culinary heritage is just as rich as its ethnic one- it combines Chinese cooking technique with an infusion of Malay ingredients such as lemongrass, coconut milk, sambal and tamarind. Here are some of the best places to get a taste of Peranakan cuisine while visiting Singapore. 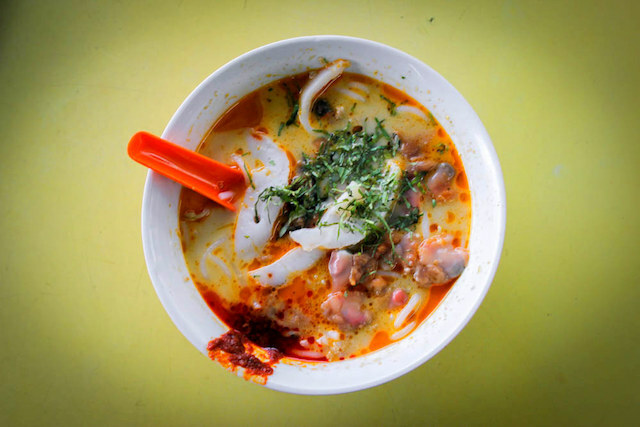 Laksa is a quintessential Peranakan noodle soup of which there are two variations: sour asam laksa from Penang and the spicy, coconut milk-based laksa lemak that is popular in Singapore. A great spot to try laksa is Sungei Road Laksa, where the laksa is cooked over a traditional charcoal grill. 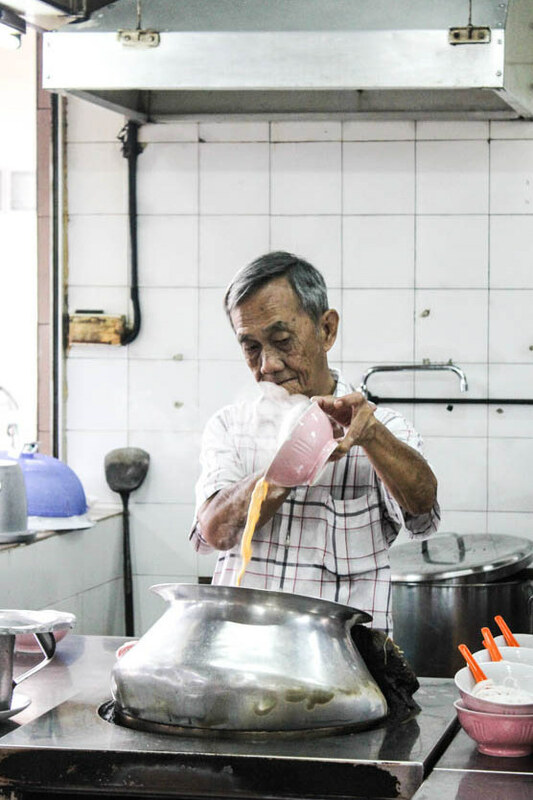 The elderly owners serve the rice vermicelli noodles al dente, which provide a nice bite in the soup. The noodles are spooned into a light coconut milk sauce and topped with fish, beancurd puffs, cockles and a fiery dollop of sambal belacan. Ayam Buah Keluak is a braised chicken and keluak nut dish, traditionally served at weddings and feasts. Like many Peranekan dishes, a good ayam buah keluak begins with the rempah: the blend of spices and condiments pounded together using a mortar and pestle. The preparation of this dish is labor-intensive. The keluak nuts are in fact poisonous and can be dangerous if handled incorrectly; they must be scrubbed, soaked for several days and pitted to remove their poison. The chicken is braised for six to eight hours with the keluak nuts in a gravy of chili, turmeric, galangal and shrimp paste. The Blue Ginger Restaurant specializes in Nonya, or Peranakan cuisine, and is known for its authentic Ayam Buah Keluak. For dessert, The Blue Ginger also dishes up a fine array of bite-sized kuih, Peranakan cakes. Popiah is a vegetable and shrimp wrap of southern Chinese origin that is eaten throughout much of Southeast Asia. The Peranakan version is a wheat wrap that encases julienned jicama, carrots and bamboo shoots, as well as shrimp, egg, bean sprouts, chili paste, cilantro and fried garlic. 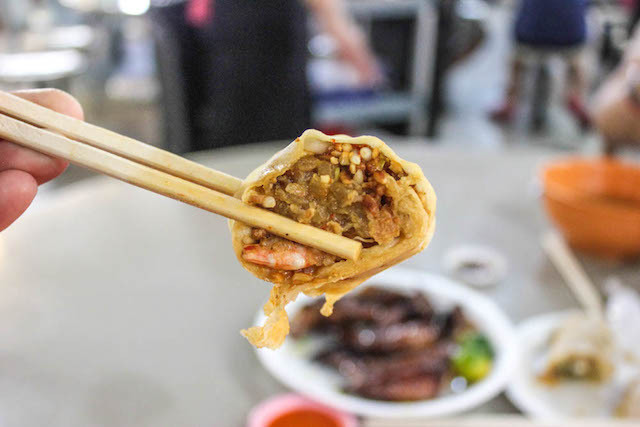 Miow Sin Popiah and Carrot Cake, located in the popular hawker center Lavender Food Court, makes a delicious popiah with a paper-thin wheat wrap. The stand also serves carrot cake, which despite the name bears no resemblance to North American carrot cake- it’s a fried turnip patty that actually contains no carrots at all! 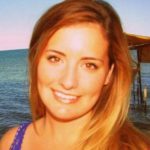 Ashley Fleckenstein is a baguette-partial freelance writer currently traveling Asia. She’s a self-proclaimed language nerd, ski bum and lover of long, pinot-fueled dinners. To read more about her adventures in Asia and beyond, check out her blog, ashleyabroad.com, or connect with her on Twitter, at @ashleyhfleck. Excellent post. You really have a knack for describing food, and it’s always cool to discover an entire cultural group I’d never heard of!